My new soft hackle for using Gambel's Quail from Blue Ribbon Flies. Bill, good lookin' fly. Almost a 3D effect with the abdomen. Well done! Great creation, Bill. As Hank points out, the abdomen looks realistic, and the Gamble's Quail hackle adds a nice touch. Those skins have many useful feathers, including some that can pass for waterhen. Very nice! I think this pattern will work very well for you Bill. Are you stocking up for another Yellowstone trip this summer? letumgo wrote: Very nice! I think this pattern will work very well for you Bill. I wish I was going to be there. Actually I am tying up for 2 friends who will be fishing the Big Sky Country soon. I am tying up some of the usual suspects that worked well at the IBF Rendezvous in 2014 and previous trips there. I think the closest I may get this year is the FFI International Fly Fair in Boise in August and the Owyhee and the Boise Rivers will be my most likely targets. Bill, that looks like it would kill during sedge hatches. 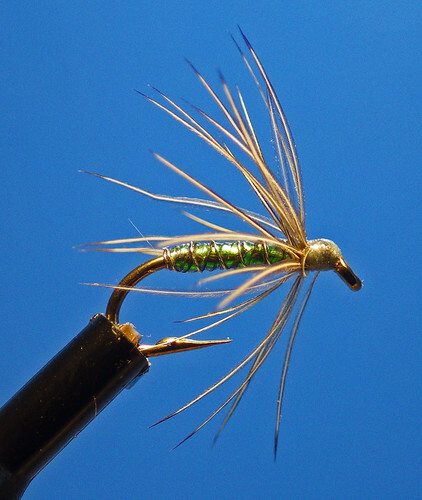 I like shiny bodies during blizzard hatches, as they make the fly stand out from the naturals, just enough.